The Golden Age of comics, masked mystery men gave way to superpowered heroes. 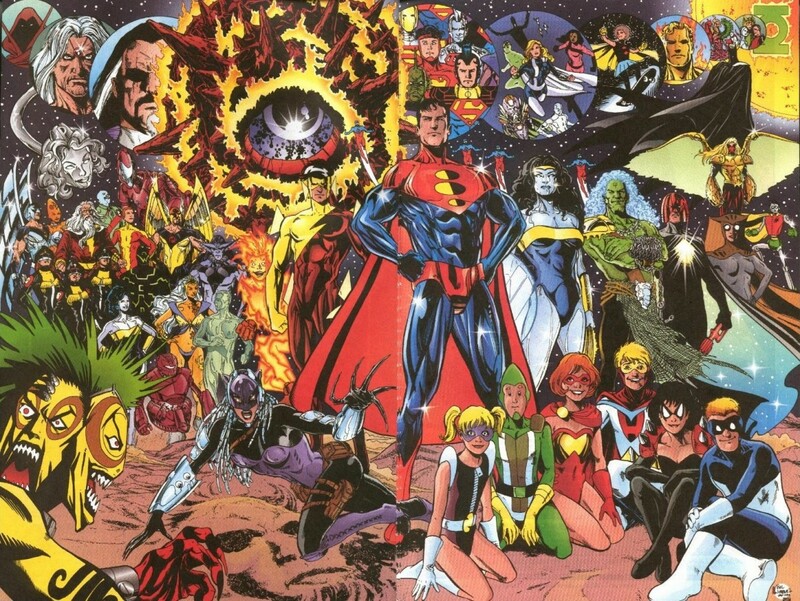 While the Silver Age borrowed from these elements, many aspects of the Golden Age (which was punctuated by the Second World War) were left intact such that following the Crisis on Infinite Earths, much of it remained as is. Early heroes like Mister America, Zatara, Crimson Avenger, Sandman, Blue Beetle, Invisible Hood, Doll Man, Flash, Hawkman, Johnny Thunder, Whip, Spectre, Ibis the Invincible, Spy Smasher, Hourman, King, Red Torpedo, Black Condor, Dr. 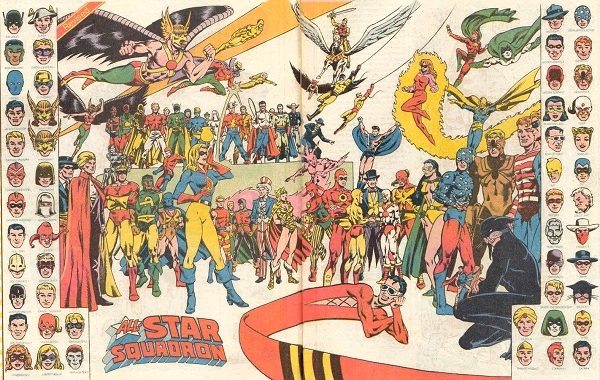 Fate, Bulletman, Green Lantern, Red Bee, Neon the Unknown, and Uncle Sam formed the basis for groups like the Justice Society of America, Seven Soldiers of Victory, Freedom Fighters, Crime Crusaders Club, and the All-Star Squadron. 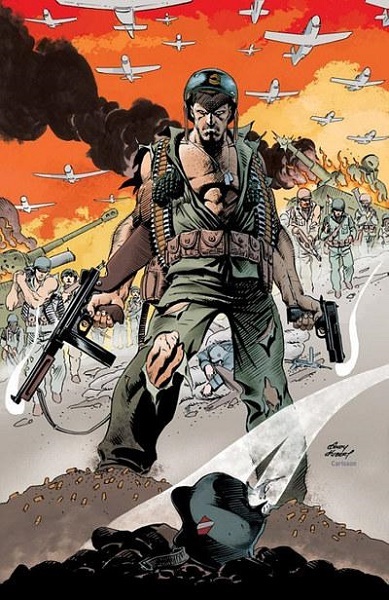 By the end of World War II, dozens of heroes fought against the Axis (as the immortal Vandal Savage stood behind Adolf Hitler, who wielded the Spear of Destiny, toward his own ends). Following WWII, a force lead by the Wizard rose to battle the Justice Society in the Injustice Society (which counted Savage as a member) which would evolve over the years and generations to counter the team of heroes. 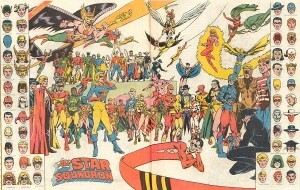 The legacy of the JSA would be carried on in their children in the group Infinity, Inc. While many costumed characters emerged to combat the Axis, World War II was also rich with soldiers. Few were likely as notable as that of Sgt. Rock and his Easy Company. Frank Rock hailed from Pittsburgh where he worked at a steel mill until he enlisted following the attack on Pearl Harbor. Joining the Army Infantry, Rock managed to survive many bloody conflicts whereas many of those he fought beside died. This lead to his rising to the rank of sergeant and serving in Easy Company where he became a leader among his men. Easy Company would be made up of others such as Bulldozer, Little Sure Shot, Wildman, Ice Cream Soldier, 4-Eyes, Jackie Johnson, Worry Wart, Farmer Boy, Long Round, and Short Round. Sgt. Rock and Easy Company became legends of WWII operating in every European combat zone during the conflict where Rock died from the final bullet fired during the war. Other notable soldiers included Hop Harrigan, Blackhawks, Boy Commandos, Ghost Patrol, Mademoiselle Marie, Haunted Tank, G.I. 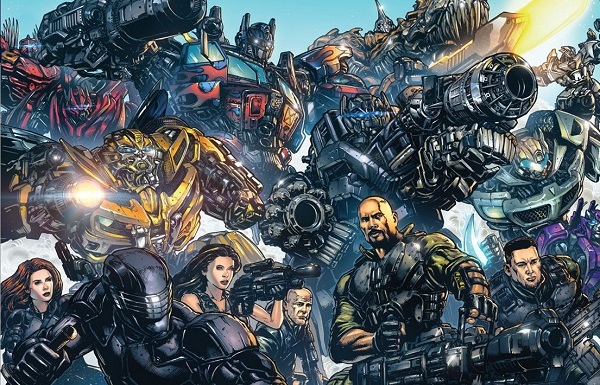 Robot, Unknown Soldier, Viking Prince, Lt. Hunter’s Hellcats, Losers, Gravedigger, Viking Commando, and the Creature Commandos. Spies also became popular around this time including Alfred Pennyworth and members of the O.S.S. which included Speed Saunders and Kana the Shadow Warrior. As Atlantis grew into the center of culture on Earth, it became necessary the nation needed to expand. Several expeditions set out to find new places that could best serve as colonies for Atlantis leading to a settlement being built in the dimension of Skartaris. Called New Atlantis, Lord Norrad would found the colony to escape the corruption of Atlantis only to be later killed by the Atlantean sorcerer Ar-Diamphos who escaped the sinking of their former nation. This new ruler turned its citizens into beast-men called the Brood Brothers using alien technology from the so-called Red Moon Gods (procured by the Atlantean Lord Daamon). In 1969, Vietnam War veteran and Air Force pilot Lt. Col. Travis Morgan would pass through a portal and crash land into the Pellucidar-inspired land of Skartaris. Morgan would take on the persona of the Warlord where he became an adventurer in a land of sword, sorcery, super-science, and dinosaurs. 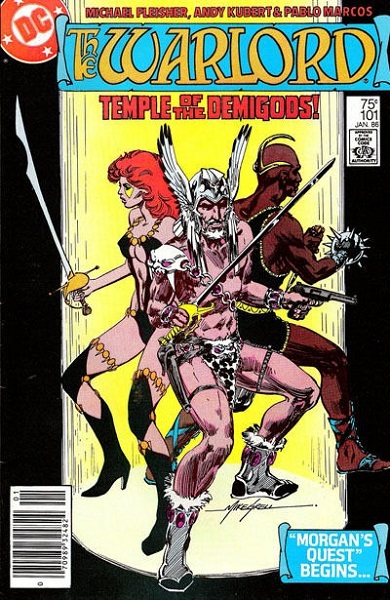 Combating the likes of Deimos (Daamon’s descendant who became Morgan’s arch-nemesis) with his minions Ashiya and Chakal in service of the Evil One, Cykroth the Unholy (Ar-Diamphos’ descendant) and his servants Lord Sabre-Tooth, Brood Brothers, Vashek assassins, and Saaba the Witch, and CIA agents Ben Stryker and Redmond (who believed Morgan defected to the USSR), Morgan would be joined by many allies including his wife Tara, children Jennifer and Joshua, King Machiste and his wife Mariah Romanova, shapeshifter Shakira, Dwarven sorcerer Mongo Ironhand, Prince Aram Al Ashir, and werewolf swordsman Mikola Rostov. In the same way John Carter spoke toward a stranger in a strange with the Civil War in the background, Travis Morgan spoke toward a similar sentiment but with a twist toward the Cold War as Morgan dealt with Russians finding their way to Skartaris and the CIA seeking him out as a possible traitor. It should be noted, time passes differently in Skartaris (even within different areas across the land) which could explain the presence of dinosaurs (although, a portal to the dimension exists on Dinosaur Island). As within the continuity of DC’s Earth only some ten or so years have passed since the Silver Age began, some twenty years passed in Skartaris but with its elder denizens seemingly unaged (reminiscent of Themyscira). The conflict between Calculha and Dark Majistra may have been ended due to the sacrifice of their son Ahri’ahn, but the powers Majistra tampered with were nonetheless damaged. The Twelve Crystals of the Zodiac, Atlantis’ secondary power source beyond the Darkworld, were dying. In an effort to maintain everything the Crystals provided towards (such as the wizards and fantastic beasts), their powers were poured into a young witch named Citrina to find a new realm where magic could again flourish. Citrina discovered Gemworld and most of Earth’s sorcerers and magical animals followed to populate this new land. Twelves Houses were constructed to maintain the Twelve Realms of Gemworld identified as Amethyst, Emerald, Garnet, Ruby, Diamond, Moonstone, Sapphire, Sardonyx, Topaz, Turquoise, Opal, and Aquamarine. 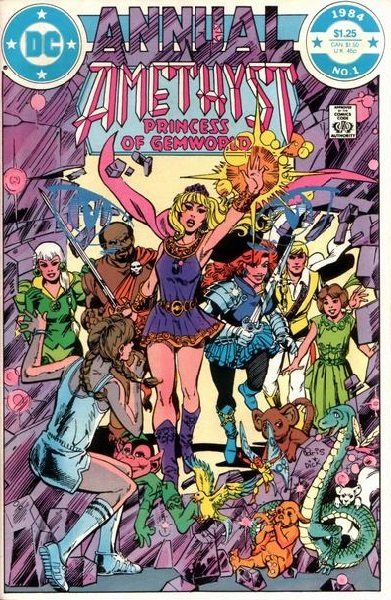 Gemworld existed in a relative harmony until at some point in the 1960s when Dark Opal of the House of Opal slew the rulers of the House of Amethyst as a prelude to conquering all Twelve Houses. Fortunately, Princess Amethyst would be saved by Citrina who brought her to Earth to be raised by humans (adopting the name Amy Winston). Dark Opal ruled Gemworld for twenty years before learning of the Princess’ survival and seeking her destruction. 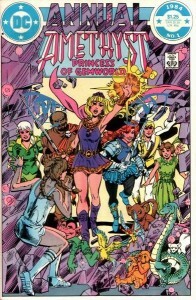 Due to the unique properties of time for Gemworld, despite being thirteen on Earth, Amethyst aged to her twenties upon returning to Gemworld (Gemworlders de-age on Earth while they grow older when they return) where she united the other Houses against Dark Opal and defeated him.